Yesterday, Apple issued a mostly minor maintenance update to Final Cut, Motion, Compressor and iMovie with one big feature that is worth discussing. The new feature is that any of these three applications will now automatically detect media which will be incompatible with future versions of the macOS AFTER Mojave and give you the option to convert it. When FCP X 10.4.4 was released, it began warning us about media that would not be supported in future versions of the OS. However, the warning was terse and VERY scary. Here’s an article I wrote about it at the time, which you need to read. NOTE: My article includes a discussion of Apple’s future media plans, along with responses from Adobe, Avid and Blackmagic Design on the impact these changes will have on their products. After that message appeared, Apple created a new KnowledgeBase page which described in more detail which formats would not be supported. As well, they announced that future versions of Final Cut Pro X would support the ability to detect and convert older media. At that time, I suggested to Apple that they extend this behavior to Compressor to help editors who didn’t use Final Cut. Apple took this idea one step further and applied it to all their media applications: Final Cut, Motion, Compressor and iMovie. This is the big new feature in this update. When you click the “Learn More” button, it takes you to this new web page that details what’s coming. Here’s the link. Just to be really clear, while the new version of Final Cut Pro X DOES require updating older projects, all existing media is still supported. It is future – and unannounced – versions of the macOS that will make 32-bit media unplayable. With that as background, here are the specifics of this update. The YouTube updates allow users to continue sending files from Apple’s applications directly to the service after YouTube deprecates their older APIs next week. In other words, this adjusts for an upcoming change in YouTube. I’m confused about one aspect of the media conversion that’s coming. For about 10 years beginning in 2008 I shot a lot of stuff with Sony XDCAM EX. That codec is listed as compatible going forward but I’m wondering about the actual structure of a file I created more than 10 years ago? You should be fine. 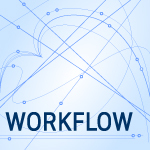 XDCAM EX is not built on a QuickTime 7 foundation. 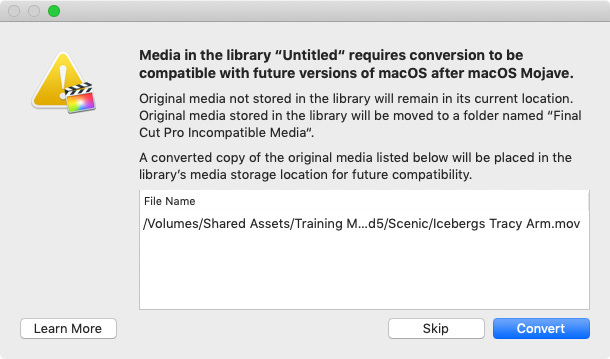 Larry, FCPX 10.4.6 will detect future incompatible media and allow conversion – but will this feature be able with the next MacOS? If not, do jump now and convert anything/everything that isn’t nailed down? The problem is that with the next macOS update, media based on QuickTime 7 won’t play. Which means that the conversion won’t work. This is why it is important to convert media BEFORE upgrading to the next OS.